First Jeans, a photo by carolinearmijo on Flickr. It’s hard to believe that Oliver is 20 weeks old. Even older than that! Twenty weeks and two days. With Lucy I had a detailed update every week. This week, I had an email from the hospital photographer update me on the week. Time is flying by! This is such a cute stage. Oliver is just so sweet. This boy is definitely not lacking in kisses from his mama. 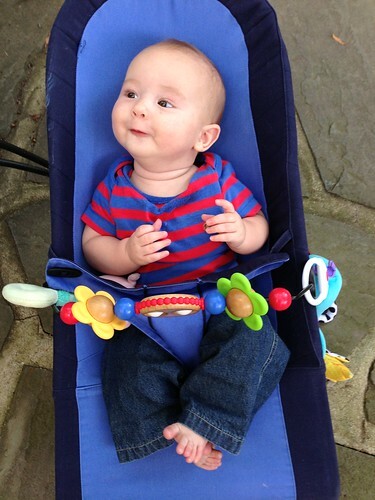 I am looking forward to him being able to sit-up in a little tripod. I want to put him down even for just a minute at the playground or the library. But I don’t want to wish this stage away at the same time. So here he is in his first pair of jeans! I managed to unearth more pjs tonight. But not before he threw a fit to go to sleep. He is not a late-nighter like his sister. Nor is he a light sleeper. I need a heavy duty sound machine if we are going to survive. But in the morning, he’s all smiles and giggles. Other than picking his sis up after school, breakfast might be his favorite time of day. Lucy insists on sitting next to him every morning, her with her oatmeal, smoked salmon, or avocado toast and him in his bouncy seat, looking at each other and smiling. They are quite a pair.